Spiritually Fit offers specialized restorative and relaxing yoga classes tailored to those going through a medically supervised drug or alcohol detox. We teach sequences of poses that help with pain, stiffness, and anxiety. We gently guide clients through sequences of postures that aid in releasing toxins from the body fat, muscle, and internal organs. Simple reclined postures stretch the legs and help to ease symptoms associated with restless leg syndrome, an acute withdrawal symptom common in opiate detox. Easy twists and compression postures apply slight pressure to internal organs such as the liver, kidneys, GI and lymphatic system to help flush toxins out of the body. All of this helps the client feel better quicker. In addition, we guide clients through extended meditation sessions using breath and body awareness to help them let go, calm down, and relax. Meditation brings peace and calm which helps relieve common symptoms of withdrawal, including anxiety, stress, and sleeplessness. Not only do we guide clients through the meditation, but we teach them the strategies to do it on their own. This allows them to face the inevitable challenging moments in life with a sense of calm and clarity to give them new perspective on big decisions. For these reasons, meditation can be a life saving relapse prevention tool. We bring a lot of the same elements of our detox yoga into our inpatient program; relaxation, healing posture sequences, and mental focus. Because there are many types of yoga being taught throughout the world, we expose clients to a variety of styles so they can find what suits them best. Some of these classes will incorporate more movement and more challenging postures, while others will be more calm and relaxing. All of these classes include aspects of meditation. After their 30+ day stay, clients will know which style they prefer. If they would like to extend the benefits beyond what they received in treatment, we can guide them to those particular classes. We also provide scholarship opportunities for graduates of the treatment centers we teach at. We offer 3 weekly donation-based addiction recovery classes in the Phoenix metro area. All the proceeds go to our nonprofit to help with scholarships for those who would like to attend more classes, or cannot make these. The classes are 75 minutes long and lightly heated. 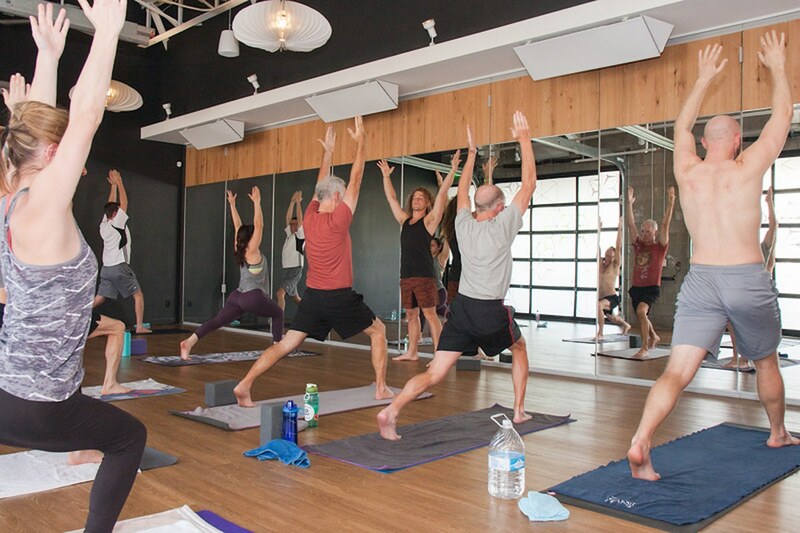 These Vinyasa yoga classes are open to anyone in any form or recovery, in addition to those looking to see how these classes or yoga might fit into their lives. We have yoga mats and waters available free of charge if needed. These are yoga classes taught by Jacob and offered for drop-in rates at studios across Phoenix and throughout the valley.